A clear door security locker is one of the best storage solutions to consider when you want a highly secure premise. Be it a corporate office or school premises or a health care center, you can create a level of discipline regarding the storage of things. As things stored in it are easily visible, it becomes effortless to maintain a watch on things that are being stored in it. In addition to this, there are many benefits that a clear door security locker is loaded with. Want to know a few of them. Read on to find out. Let me walk you through the 7 prominent advantages of a clear door security locker. Read on to find out them. With clear door security lockers, you can make it easy to view the things that are being stored in it. This type of storage solution gives 100% visibility to the content stored inside it. This makes it easy to have a look at the content that the users are storing inside it. 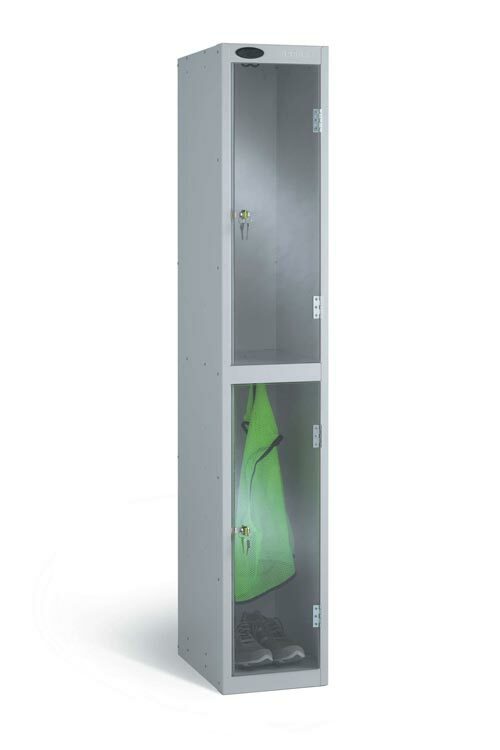 Be it in school premises or a workplace or a residential place, this storage solution proves to be the perfect option when it comes to a high visibility security solution. As it is easy to keep a watch on the things that are being stored, it impends the storage of unwanted or illegal things, maintaining a level of security on the premises. Apart from providing a clear view of all the things that are stored in it, this type of storage solution also proves to be an epitome of safety and security. It comes with a strong lock and key system that makes it accessible only to the person who has been assigned the locker with. One more benefit that adds to its popularity is its durability. It has the ability to support heavy objects stored in it. In addition to protecting things from being stolen, it also keeps the germs and bacteria at bay as it will be smeared in Active Coat – a germ resistant coating. When all the stored things are clearly visible, it becomes easy for the users to spot their respective storage locker. It will help them in identifying any missing thing on an immediate basis. They need not invest in a lot of time and energy in hunting around their respective things or locker. Also, it will help them in keeping a watch over the things that they have stored in it. You can get this storage locker tailor made as per your needs and requirements. Whether you want it to be small, big, horizontally wide or coated in some of the most vibrant colors, you can easily customize it according to your demands. Also, if you wish to personalize it with the company’s logo or the colors, you can get it done without any hassle. You will have a wide range of options to choose from. Different colors, different door options, the quantity of door, size of the storage option and the list extends up to infinity. With a large number of storage options to consider you get to make a choice that very well resonates with your needs and requirements. Clear door security lockers play an important role in adding to the surrounding’s beauty. Available in a wide range of color, pattern and design you have the choice to select an option that not only best suits your needs but also adds beauty to the surroundings. You can play with colors, shapes and textures to uplift the ambience. This type of storage solution plays an important in positively influencing the productivity factor. As it provides a safe and secure place to store things, the user can easily focus on other important work instead of worrying about their belongings. Apart from this, they need not waste their time in hunting down their lockers or their belongings as it would be clearly visible. Consequently, all these generously contribute to acing up the productivity level of the users. Above-mentioned are the few prominent advantages that you could lay your hands on when you invest in clear door security lockers. They not only ace up the security factor, but also generously contributes to providing a neat and clutter-free surrounding. That being said, this type of storage locker will indeed prove to be the perfect storage solution for places that demand high security. This entry was posted on Tuesday, July 17th, 2018 at 6:17 am	and is filed under Lockers. You can follow any comments to this entry through the RSS 2.0 feed. You can leave a comment, or trackback from your own site.